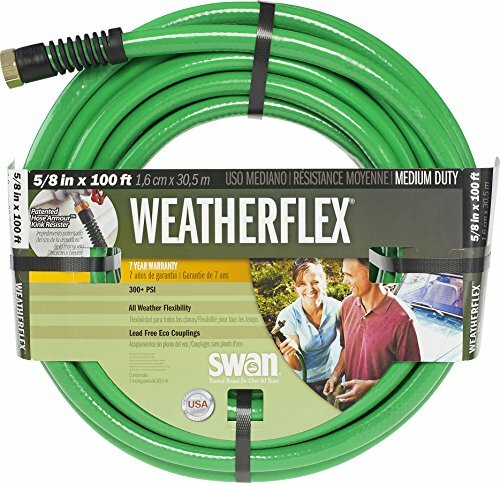 The Swan Weatherflex Medium Duty All Temperature Use Garden Hose is a garden hose ideal for all year, medium duty use at home. Constructed with a hose armor, this garden hose has the ability to stay flexible year-round during all temperatures and allow you to use hose without adjusting and backtracking. Hose armor is kink-resistant and comes with a collar guard that prevents kinking at the spigot. Knit reinforcement in key areas allows for 300 PSI burst strength and continues flowing steady pressure water with solid brass, lead free couplings. Garden hose is green and made in the USA; comes with a 7-year warranty.